Do you love travelling, but hate having your nights out spoiled by looking second best in wrinkled clothes? Or perhaps you need to guarantee that you’ll be looking your best when you travel for business? I know the feeling. Wrinkled clothes may seem like a small problem, but they can be one of those things that you’ll always be conscious about, and can really put a damper on what should be an amazing time abroad. Thankfully, there is a solution. We’ve researched the market to find the best travel irons to bring with you on your travels – and curated them down to our top 5 recommendations for you. Whether it’s freshening up a suit or straightening out the family wardrobe for a big event, we’ve got you covered. Each of these irons are super lightweight, easy to use – even in an awkward-sized hotel room – and almost effortless to tuck away inside your suitcase. Let’s get those wrinkles dealt with. 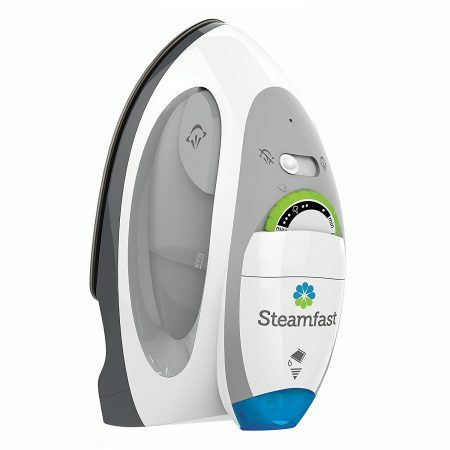 If we could only recommend one product to you, it would be the Steamfast SF-717 Mini Steam Iron. We really can’t believe the size of this thing – it’s tiny! An iron so small it almost fits inside the palm of your hand, it’s an absolute cinch to take this with you on any kind of trip; no matter your luggage space. At a weight of just under a pound, and a length of just over 5 inches, you could almost keep this little iron in your coat pocket. Not only is it small, but it works fantastically well, too. The non-stick soleplate is nice and smooth, and with an anti-drip protector, it won’t leave water marks on your freshened up clothes. It’s small size means it heats up ridiculously quickly, and the palm rest makes it effortless to glide it across fabrics – comfortably reaching every detail and delicate part. It’s also built with your travelling needs in mind, and can deal with any common travel issues – the 7.5 foot long cable means you don’t have to worry about awkwardly placed power sockets, and the dual voltage technology means it’ll work in power sockets outside of the US, too. We think it’s the perfect companion for any smart traveller. The Steamfast SF-717 in action. This mini travel iron is absolutely tiny! At just over 5 inches long and less than 3 inches wide, it cups perfectly into the palm of your hand. And with such a small plate, it heats up tremendously quickly and as hot as any full strength iron. The strong heat this produces means that you just need to glide it across the creases of your clothes as you iron. The small size, and ridiculously light weight (under 1lb – the lightest travel iron on the market) makes it ideal for anyone looking for an iron to take with them while travelling. Now just because it’s small, don’t think this little guy can’t pack a punch. All the features that are important are (literally) at your fingertips. Dual voltage means you plug it into any electrical socket and have it work instantly, and the non-stick ceramic soleplate is surrounded by an anti-drip design that’ll stop any hot condensation dripping down and burning you or your clothes. The 7.5 foot long power cord means that no awkwardly located hotel power socket will get in your way, and the fully working steam power and three heat levels mean this compact travel iron can tackle any kind of clothes and fabric you put under it. Everything you can ask for in a travel in a ridiculously small package. This iron is packed full of modern functionality, while being incredibly small and weighing in at less than a pound. That said, all of this comes without a premium price task – making this our top value recommendation. Honey I shrunk the steam iron. The Sunbeam ‘Hot-2-Trot’ (yes, that’s actually the name!) is a great little compact travel iron. Being slightly heavier and larger than the Steamfast (1.4lbs vs. 0.9lbs), it’s still ridiculously small and effortlessly easy to include when packing up your travel suitcase. Also boasting dual voltage, this iron’s super quick heating power will have it ready to go in seconds – wherever you find yourself ‘trotting’ off to. The main selling point of this model is the unbeatably low price that it comes in at – we’ve yet to find another of these mini-irons that cheaper than this one. That being said, the build quality is still up to scratch. As long as you don’t overfill the water compartment it won’t hiss or spit, and the non-stick soleplate looks robust enough to last through plenty of years and travel miles. This cheap travel iron is ideal if you’re looking for a small and lightweight pick-me-up to take with you on your travels. While being inexpensive, it still works well and doesn’t sacrifice build quality for cost savings. This is a great all-rounder that will fit in the palm of your hand, and the corner of your suitcase. The bigger (but still very little) brother to our #1 pick. The Steamfast SF-750 is like the big (but still very small) brother to the mini Steamfast model at the top of this list. It’s kept all the same perks and features, but just upped the size on everything a little bit. The 7.5 foot long power cord is now 8 foot, the water tank is up from 1.4oz to 2oz (and now with clear plastic), the quick heating non-stick soleplate is bigger, and the weight has increased to a staggering 1.3lbs. They’ve also improved on the heat levels, including a variable dial for a much broader range of heat settings. In short, this model is an improvement in almost every way on Steamfast’s mini model – at the cost of a bit of a bigger size. There is one thing to watch out for however – this iron actually has no handle! Instead, it rests under your palm almost like a big computer mouse. While this is a turn off to some, we’ve found that it’s actually become a favourite part for a lot of people – the light weight and palm rest makes the iron almost glide as you move your palm around. While we still can’t get over the tiny size of Steamfasts miniature model, this compact travel iron improves on almost every aspect at the sacrifice of a little more size. So while it hasn’t made our best ‘travel’ iron specifically, this could be a great solution if you’re not entirely strung up finding the smallest iron, but instead value a bit more functionality. A fully functioning iron and clothes steamer. This Hamilton Beach Travel Iron is also a clothes steamer in it’s own right. It can produce continuous steam while being held vertically, meaning you can both fully iron and steam your clothes – and with dual voltage capability, do them both from almost any hotel room in the world. However, while it’s more than capable of continuous vertical steaming, it’s worth noting that the steam isn’t made to be applied downwards onto clothes; this model is an iron and a steamer; it’s not a steam iron! Now, when you see this iron, your first thought is probably that it seems a lot bigger than the other compact irons on this list. And it is. At 7.3 inches long, it’s length is about 50% larger than the miniature steadfast model. That being said, what’s really impressed us is that the extra size hasn’t meant extra weight – this Hamilton Beach iron weighs only 1 pound! We think that the bigger size is just to make room for the 2.35oz water capacity that’s required for continuous steaming. So while it’s not ‘miniature’, you still definitely won’t feel this affecting your suitcase weight. 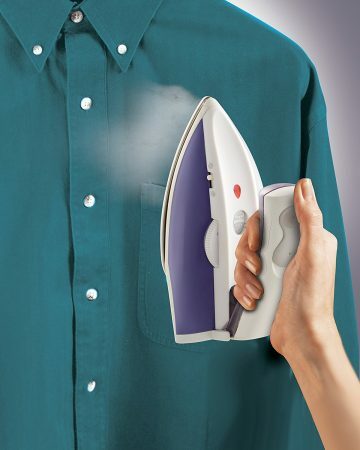 An ideal solution if you’re looking for both an iron and a steamer that you can bring with you on your travels. With a foldaway handle and dual voltage capability, this iron is a cinch to bring with you to whatever place you’re travelling to. A fantastic hybrid between a small travel iron and a home steam iron. 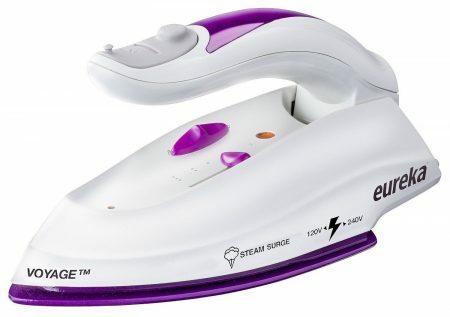 This aptly named Eureka Voyage iron is a great hybrid between a travel and steam iron. While it’s larger than most of the other irons on this list, it’s far from heavy (weighing in at 1.5lbs), and comes with full steam burst capacities; being able to send bursts of steam directly down onto clothes or while being held vertically. The nano-ceramic sole plate is very smooth and is completely ‘immune to rusting’ – we’ve not had any long term tests to prove that, but the plate certainly seems very robust and we’ve seen no rust related complaints during our research. Despite being a larger sized and iron and being fully steam capable, the price on this model is impressively low – especially with the included heat-resistant travel pouch for quickly packing up the iron if you’re in a bit of a rush to get up and go. With an 8 foot long cord and dual voltage capabilities, it’s ready to take on even the most awkward of hotel sockets.n with you anywhere. 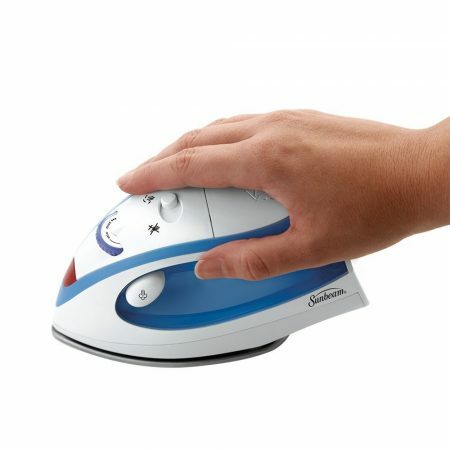 This iron’s a great hybrid for anyone looking for a travel iron that could also be substituted for a fully fledged home iron. 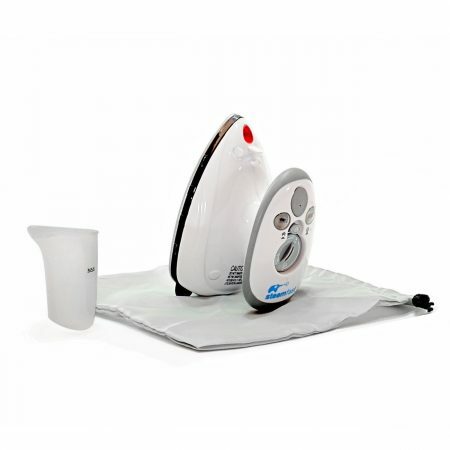 It’s got great steam capabilities, is just large enough to act as a normal iron, but with a foldaway handle, dual voltage power, and an 8 foot long power cord can be taken with you anywhere. 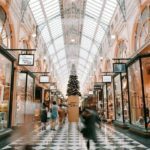 When it comes to spending your hard earned cash on a product, we think it’s important to know exactly what you’re looking for. When it comes to travel irons, there’s a few different features that can change from one model to the next – making them better or worse for different tasks. In this section, we’ve covered the most important of these to keep track of. By understanding all the different aspects that your future product could potentially have, we think it’s much easier to know for sure when you’ve found the right model for you. Product Weight & Dimensions: Consider how easy the iron will be to pack into your suitcase, and whether you’ll notice the weight difference. Cord Length: Whether you’ll be able to plug into even the most awkwardly placed hotel power sockets without having to MacGyver together some kind of DIY ironing board on the floor next to it. 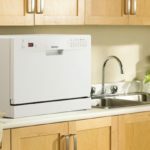 Warranty & Customer Service: While most appliance warranties are 1 year, it’s also worth checking customer reviews to see whether they had a pleasant experience if they had to contact the company. We try to highlight this about a company if we see reoccurring good or bad things about them in our research. Dual Voltage: Will you be able to plug it into power sockets outside of the US? 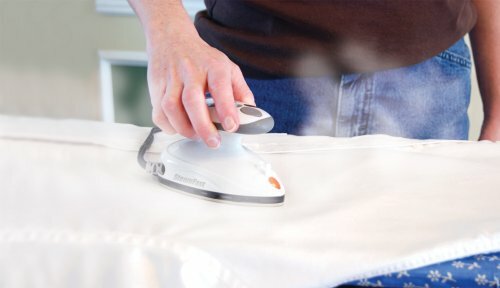 Steam Functionality: Can the iron produce steam – and if so, whether it’s in bursts, or act as a continuous steamer. Temperature Settings: Consider how easy it’d be to switch from ironing out a heavy pair of jeans to a delicate summer dress. Anti-Drip Protection: Look for a guard around the base of the iron that helps stop the hot water staining your clothes, or even burning your hand. Soleplate: Is the plate of the iron non-stick or ceramic, and is there any mention of it rusting or causing issue with certain fabrics? While each of the aspects above are important to look out for, you don’t typically need to worry about them so much when choosing one of the models we recommend on this list. We’ve vetted each one and curated the market’s best to this list, so they all typically tick the boxes above. If they miss out on anything, we’ll highlight it in our review. Travel irons are one of those great little appliances that make you wonder how you ever functioned without them. 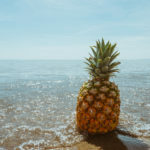 It sounds silly, but being able to make sure you’re going to be looking your best while on holiday can be a really grounding feeling – something that you really can’t put a price on when you’re in a strange place. Not to mention all the other uses possible for them – especially loved by sewers – these mini little irons are a great solution to creased up travel worries. If you’ve gone through our list and not found a model you love, then try heading over to Amazon’s bestselling list for irons, and see what else is out there. Just be sure to keep the factors outlined in our little guide above in mind – and make sure that you’ll find yourself a very hot little travel companion! Found your ideal iron? Then complete your travel set with an on-the-go iron proof mat to make ironing on tables or desks even easier.